Enrolling a student in the district. Updating demographic student data (last name change, address change, etc.). Please note that while the initial step of enrollment is completed online, we require all parents or legal guardians to finalize the process in-person. Determine residency status if you're unsure what school district you live in. You can search for your address HERE. If you need assistance, call Student Services at 248.341.6390. Once you complete the Online Registration, you will be invited to schedule an appointment with Student Services located at 7273 Wing Lake Road. This appointment must be attended by a parent or legal guardian. At this appointment, please bring the items listed below ("Documents Required" AND the 4 items needed for "Verification of Residency"). This appointment will take approximately 15-20 minutes. This list is intended to help you through the enrollment process. In every case, originals are required. Where appropriate, copies will be made and originals returned. Child's Original/Certified Birth Certificate. If your child was not born in the United States, a valid passport is acceptable. Proof of Satisfactory Vision screening (for students enrolling in kindergarten), completed after age 3; submit statement from examining official. Michigan Law requires a vision screening for kindergarten entrance. Vision screening done in preschool by a health department technician or at a doctor’s office fulfills this requirement. Oakland County Health Division offers free vision screening for County residents. Call (248) 424-7070 for an appointment. Your child's pediatrician may have screened your child at a well visit, so that office is a great place to start. Parent/Guardian Identification (valid driver's license or picture identification card with district address). Official Immunization Record (use Immunization Checklist or submit copy of official record). Certified Copy of Appointment of Guardianship (if applicable). Special Services documents - Current IEP, MET or 504 for students receiving services (if applicable). Any three of the following documents (with district mailing address) and dated within the last 60 days are required to prove residency. Mail should be from three different sources. We do not accept cell phone bills, voter's registration, junk mail, or mail from Bloomfield Hills Schools. * Students who were previously enrolled but have not actively attended a Bloomfield Hills School within the last six months are considered "new" students. Complete this form using a computer (a smartphone or tablet is not recommended). Please read the instructions carefully on the introduction page. If you have questions or are unclear while completing this form, please send an email to stuservices@bloomfield.org or call 248-341-6390. What Is In District Open Enrollment? Bloomfield Hills Schools commonly allows resident students to attend school at the building of their choice, if certain requirements are met. Space is available at the receiving building. Transportation is provided by the student/family. Approval from the "school of residence" principal is obtained. Approval from the "school of choice" principal is obtained. Approval from the Assistant Superintendent for Instruction is obtained. How Do I Exercise My In District Open Enrollment Option? After approving/rejecting the request, the Assistant Superintendent for Instruction notifies the parents/student, building principals, and Student Services of the final decision. If necessary, contact the school of choice to confirm the first day of attendance. A transfer request is building specific. A new request must be submitted if your child changes buildings for any reason. Transfers, once granted, will remain in effect for at least one school year and continue in effect following that period unless the student, parent/guardian, or the school takes formal action to rescind the transfer. Requests to rescind a previously approved transfer must be submitted in writing. Bloomfield Hills Schools accepts tuition-based students, as space is available. Grade level and school building may vary availability. Enrollment requires a $1,500 non-refundable deposit. Balance of tuition is due August 1 unless enrolled in the 10 month Installment Plan. Installment plan requires an additional $300.00 processing fee per student. Enrollment after August 1 requires full tuition payment at the time of enrollment or enrollment in the 10 month installment plan. If you choose the Installment Plan, a $1000 non-refundable deposit will also be due with the first payment and processing fee. An annual deposit of $1,500 is due April 30 to secure continued enrollment for the next school year. Visa, MasterCard, or Certified Check/Money Order required. All payments are nonrefundable (tuition and deposit). Students must enter with and maintain at least a 2.0 GPA, or equivalent. (Most recent transcript, report card and end of year report card for the last three school years required at time of enrollment). Students must enter with and maintain satisfactory behavior. Omission of information regarding academic and/or behavioral issues will result in termination of enrollment. Transportation is not provided for tuition students. High school students are not guaranteed a parking permit. Lottery for parking at the high school takes place annually. Refer to Tuition Enrollment Instructions for more information. Review requirements to ensure student meets academic and behavior requirements. Complete Affirmation of Discipline form. Deliver completed form and additional required documents to the Student Services office located at 7273 Wing Lake Road. This must be done in person by a parent or legal guardian. Once student is accepted complete enrollment process and pay deposit and/or tuition as required. This list is intended to help you through the enrollment process. In every case, originals are required and copies will be made. Bloomfield Hills Schools welcomes children from all over the world. 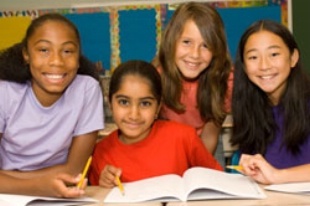 Our goal is to expedite English language learning and enhance each child's acculturation into American schooling. We have several options available for English language learners. Our Newcomer Programs are designed as a one-year intensive English language experience. The District classrooms, located at Lone Pine Elementary and West Hills Middle School host non-English speakers in first through eighth grades. Children are welcomed into a friendly group atmosphere where basic interpersonal communication skills and academic language are taught in an anxiety-free learning environment. As the students' English proficiency increases so does the opportunity to join their English speaking peers for additional academic instruction. Non-English speaking high school students are enrolled in English and social studies classes specified for English language learners. Students who have limited English proficiency (LEP) receive academic support from certified English as a Second Language (ESL) teachers in addition to their classroom instruction. ESL support continues until students reach a level of English proficiency as determined by annual assessments. Families are notified when students are eligible for ESL services and are encouraged to be involved in the educational process. *Please be sure that every fax includes your child's name and school.